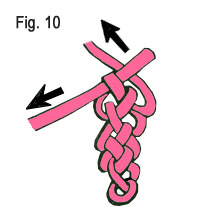 These Loop Stitch Instructions is a fast and easy knot to achieve once it's learned. One 1 yard strand of plastic lacing = about 3.5" row of knots. Fig. 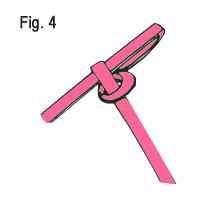 1- Fold the Rexlace in half. The middle will be your starter point. 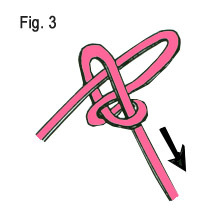 Form a loop and wrap one strand back and around the other as though you were going to tie a knot. 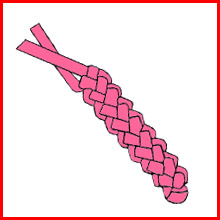 Stop before making a knot. Fig. 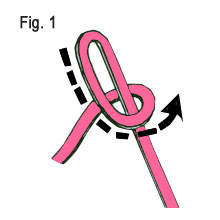 2- With the strand you brought around from the front, bend this strand into another small loop or "U" shape. 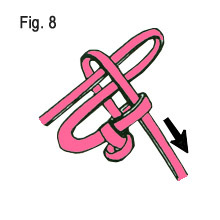 Pass this loop through the other loop, as though you were going to make a knot. Fig. 3- Keeping the new loop steady with one hand. With the other hand, (following the arrows,) tug on the loose strand of Rexlace to capture the new loop. Fig. 4- Your stitch should look like this when full tightened. See here you have another loop to feed. Fig. 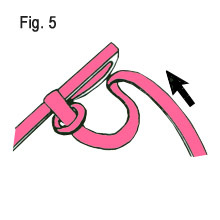 5- Using the Rexlace strand you just tightened, bend this up into the new loop. Follow the direction of the arrow. Do not pass this strand all the way through the loop, you only need to push a small loop through, about 1/2" or .5 inch or 1 cm. Fig. 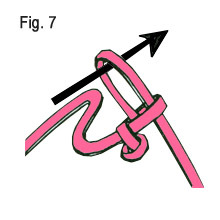 6- Once the loop you just made is through the old loop, pull on the dangling Rexlace strand from the old loop, (follow the direction of the arrow.) This will capture the new loop. Fig. 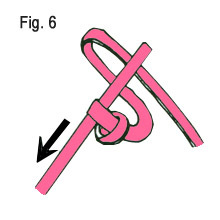 7- Using the Rexlace strand you just tightened, bend this up into the new loop. Follow the direction of the arrow. Do not pass this strand all the way through the loop, you only need to push a small loop through, about 1/2" or .5 inch or 1 cm. Fig. 8- Again, tighten the stitch by tugging on the end of the old loop. This will capture the new loop. Fig. 9- Repeat the weaving process in Fig. 5 or 7 until only a little Rexlace remains (when you can make no more loops,) or you achieve the desired size of your project. Fig. 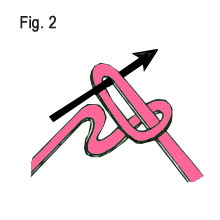 10- Follow the directions of passing one loop through the other. 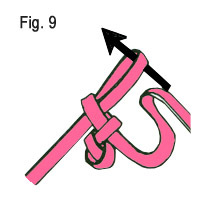 Instead of forming a new loop, pass the end of the Rexlace strand through the loop and tighten by tugging on the end of the loop. Now no more loops can be formed. Trim leaving a small tail on the end so that the Rexlace will no unravel. You may also finish with a knot if you would like for extra security.